What have you been doing with your life? Let Sony SmartBand Talk help you log it. The SWR30 is basically a SmartBand with Talk features, a hybrid of a fitness band and a full-fledged smartwatch. The strap feels really comfortable against the skin and it felt next to nothing when I wear it. The device is waterproof and dustproof with IP65 and IP68 rating, so you can wear it while you bathe or swim and most certainly when you sleep. It has a 1.4-inch E-ink display which doesn't require backlight to see the screen, though I'd wish it had an optional backlight which I could activate in the dark, similar to what digital watches had. A drawback of E-Ink display is ghosting, where the previous screen appears faintly. The device automatically refreshes the display by "flashing". The big plus point is that you can see the display in any lighting conditions during the day. As the name suggests, The SWR30 has talk features, which means it has a speaker and mic, supporting HD Voice quality. Speaker quality is sufficient for indoors but not so audible outdoors. With Voice Control app installed, you can even speak to the SmartBand Talk to retrieve some information. Its commands are limited to time, weather, schedule, set alarm and timers, calls, unread messages. The app seems to be able to recognise local accent, although uncommon words will not be recognised My daughter had a fun time playing with this feature. Its built-in accelerometer and altimeter sensor will detect the type of activity you are doing (walking, running, stationery, etc. ), and stats will be presented in the Lifelog app. 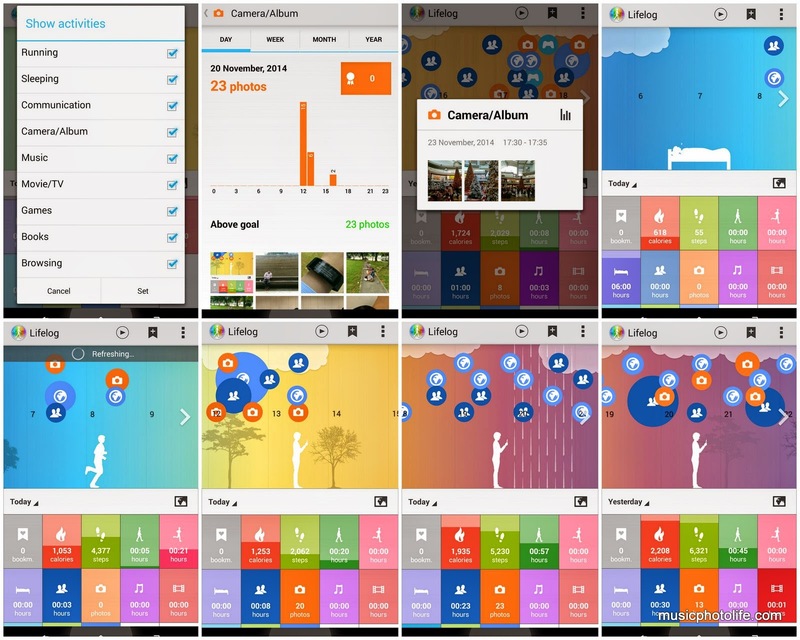 The Lifelog app also tracks activities that you do on the phone, including how long you use the Internet, listen to music, watch video, what photos you took. With the latest firmware update on 29 Nov, sleep tracking is supported. 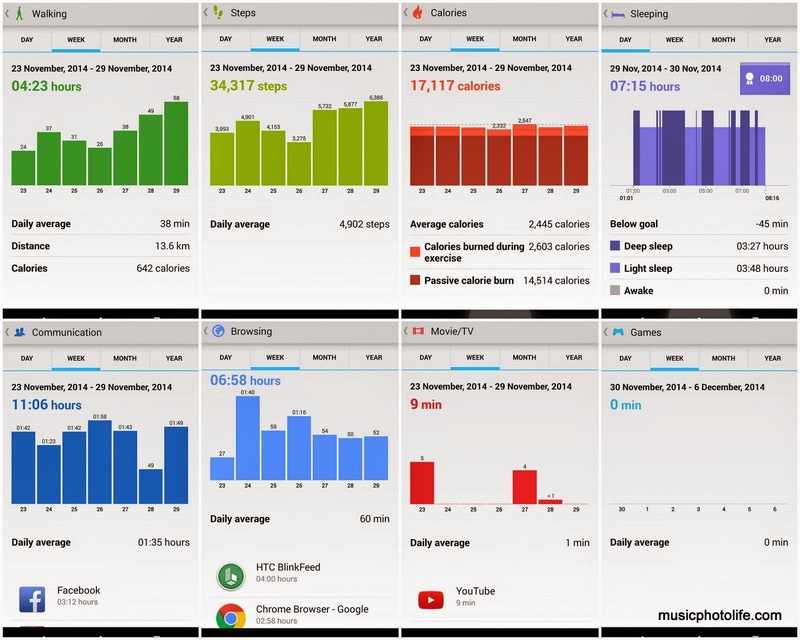 Analysing the statistics offers me an insight of my daily activities and usage behaviour. From the collage below, you can see that I do not spend much time on watching video, and do not play a single game on my phone. The browsing activity is skewed due to the app monitoring the HTC BlinkFeed background updates. The SWR30 works with all Android devices. 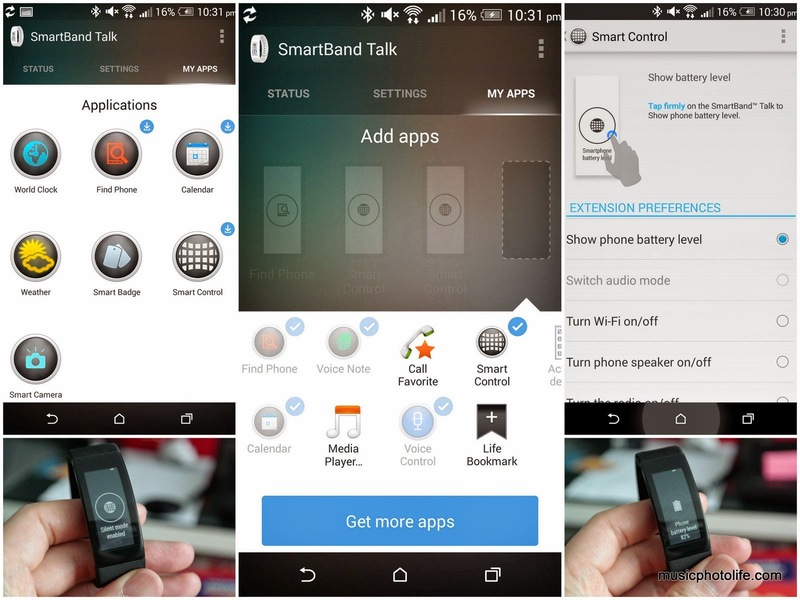 Once you install the SmartBand Talk app from Google Play Store, you can customise and sync the settings to the band. There are apps which you can install, albeit limited. As of now, it is not possible to change the watch face. The interaction with the band is limited to hard-tapping the device. Mind you, there is no touch-screen capability, it merely detects the touch impact to change the display. Like any decent wearable device, it notifies me of any notification from the paired device when my phone is not with me. But the only purpose of the SmartBand Talk is to alert you of events. It does not store notification history. After a while, the event will disappear from the device, without any indication that you ever had any notification, and neither is there any notification list to retrieve. So, if you happen to miss out any incoming notifications on the SmartBand Talk and ignores it, you will not be able to see from the SmartBand Talk moments later what events you have missed. You have to refer to your smartphone. This certainly creates some insecurity, as I have indeed experienced missed notification while on the move, as I did not feel the vibration on the SmartBand Talk. The advertised battery life is 3 days per charge, but over the review period, I am consistently getting just 1.5 days. The battery indicator is embedded in the activity details page, and if you missed the low battery indicator, there is no other indication on the watch face. Once I was caught off-guard when the battery level dropped to 5%. Fortunately, it takes less than an hour to give it a full charge. 20 minutes is all it takes to fill it above 50% which could last you an entire day. 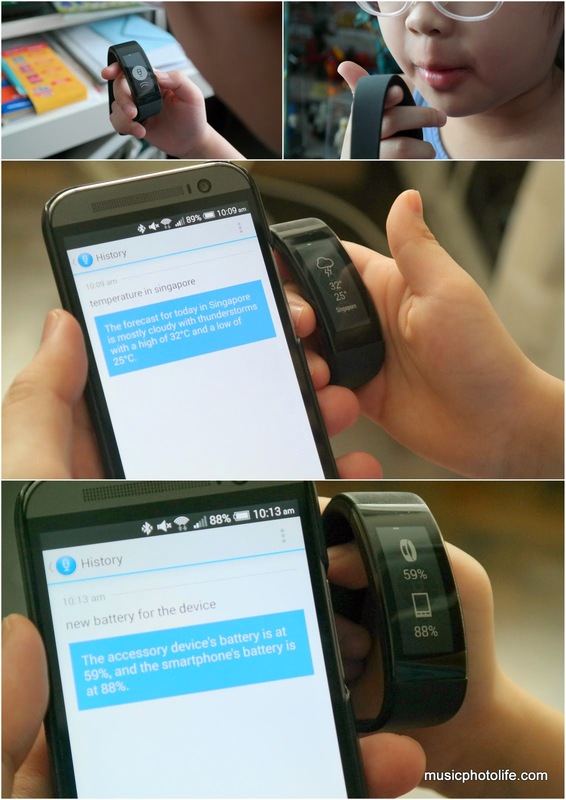 The SmartBand Talk can be charged using the standard micro USB cable: no need for any dock! I have enjoyed wearing the Sony SmartBand Talk throughout the review period. I find that it offers 2 main purposes for me: to track my activity, and to notify me of my smartphone events. I like how light and comfortable it wears on my wrist. I don't fancy using it to make calls, as it is just too flashy and I lose privacy of conversation over the speakerphone. The other installable apps merely provides some geek factor to the device, as the functions are extremely limiting given the device uses E-ink which is essentially monochrome, is not touch screen, and does not support any scrolling to display more information than it can fill within the display. There are potential for Sony to update the firmware to improve on some features. For me, I would love to see some on-screen indicator that I have missed notifications, and the ability to see a brief list of the notifications I have missed from the device. You will enjoy the SmartBand Talk if you want a fitness band but not a full-fledged smartwatch. Sony faces intense competition from the other more established fitness brands, who are starting to incorporate basic smartwatch functions similar to SmartBand Talk, but the latter might be able to win some votes if Sony can update the core capabilities to improve on the smartwatch functions. This article was first published on Music.Photo.Life.